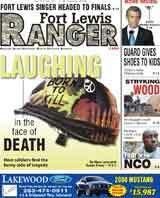 FORT LEWIS, Wash. (AP) - Two soldiers from Fort Lewis have died, one in Kuwait and the other in Afghanistan. The Defense Department says 32-year-old Pfc. William T. Dix of Culver City, Calif., died Sunday at Camp Buehring, Kuwait of injuries from a non-combat incident. The incident is under investigation. Dix was assigned to the 14th Engineer Battalion, 555th Engineer Brigade and had been in the Middle East in March. He enlisted in the Army on April 7, 2004, after serving in the Marine Corps and the Army Reserves. The military also reported the death of 30-year-old Sgt. 1st Class David L. McDowell of Ramona, Calif. He was assigned to the 2nd Battalion, 75th Ranger Regiment, and died Tuesday in Bastion, Afghanistan, of wounds from small-arms fire. The payroll of the military has surpassed $1 billion. Click here fo rthe PI's report. As my wife and I stood patiently in the long line at Subway, I think I finally discovered why being deployed two times to Iraq makes me different from those around me. There in front of me stood two young men talking loudly and being rather obnoxious. I tried to ignore these clowns, but as much as I wanted to, with every foolish act they exhibited I became more infuriated. In my mind I was screaming, “Please shut the hell up and grow up.” It wasn’t long before one of the young men was interrupted from their circus performance by a phone call. I normally don’t pay much attention to people talking on their cell phones, but this time I couldn’t help it. The conversation I overheard put some things in perspective. The young men were fresh out of Basic Training. They had just arrived at the installation and were beginning their military careers. These two men happened to be wet behind the ears infantrymen, or shall I say boys. They made it clear to everyone in the Subway that they were going to Iraq and planned on getting them some … (use your imagination). I stared at the ground gritting my teeth. I felt this overwhelming desire to confront these young soldiers and tell them what I felt about their comments and their disgraceful presentation of an American solider. My wife tapped my shoulder and said quietly, “Let it go. They’re just young boys.” Once again I found myself going through my life’s slide show. I started to think about how I was before I deployed the first time, and for that matter, how some of my friends were. Were we ever like these two young men? With that incident on my mind, I spent some time this week asking soldiers who have been deployed what they think the big difference is between deployed soldiers and non-deployed soldiers. Their answers mirrored what I believe. The following traits seem to be the most mentioned in the survey of 50 soldiers who have been deployed twice. Deployed soldiers' characteristics: bearing, confident, courageous, possess integrity, decisive, enduring, tactful, able to take initiative, cool, mature, assertive, dry sense of humor, competent, committed, creative, self-disciplined, humble, flexible, empathetic, compassionate. Non-deployed soldiers' characteristics: Eager, uneducated on the realities of war, wet behind the ears, not as disciplined, egotistical, loud, lack of appreciation for life, judgmental, indecisive, invincible mentality. When I look back and see how I used to be and what I have learned on my two tours, I am thankful that I am still around to teach young men that once you get on that bird and fly away it is real and there’s no mommy or daddy. The streets are full of people, and the sounds of explosions and gunfire are all around. These are meant to do one thing — and that is kill. When I think of those men in the Subway, I only pray that through their training over the next months, or however long it is, they learn to grow up and realize that the party is almost over, and now is the time to start getting right — in actions and in speech. The 864th Engineer soldiers from Fort Lewis enjoyed an organizational day - click here for the story and photos. The Grand Marshal this year for the Lacey Spring Fair, May 17-18 is Ist Sgt. Richard Stickell and family. Richard is a graduate of North Thurston High School. His multiple deployments include Operations Desert Shield, Desert Storm, Deny Flight, and Iraqi Freedom. Members of the community are encouraged to participate in the parade. This free, premier family event draws more than 15,000 people who come to enjoy great entertainment and fun for all ages. Visit www.laceyspringfunfair.com for more information. FORT LEWIS, Wash. – Approximately 100 soldiers from the 66th Military Police Company are expected to return from a 15-month deployment to Afghanistan on Tuesday, April 22. Approximately 50 more Soldiers from this unit will return later this month to complete the unit’s deployment. The Soldiers are scheduled to be welcomed home by their families in a ceremony to be held that afternoon at Soldiers Field House, at approximately 4:30 p.m. The 66th Military Police Company deployed to Afghanistan in January, 2007. While deployed, the unit’s Soldiers trained Afghan police while providing security and law enforcement support to U.S. and allied forces in the region. WASHINGTON (Army News Service) -- Eight Army officers including two from Fort Lewis have been selected for 2009 Olmsted Scholarship to study overseas. Since 1960, the Olmsted Foundation has sponsored the scholars program to provide broadening opportunities for military officers to live and study at a foreign university. Assignments for the selected officers next year will include Asia, the Near East, Europe, Africa, and South America. Capt. Christina B. Bembenek, Company A, 319th Military Intelligence Battalion, Ft. Bragg, NC. Capt. Wilbur W. Hsu, Alpha Battery, 3rd Battalion, 7th Field Artillery, 25th Infantry Division, Schofield Barracks, HI. Capt. Joshua D. Kaser, 191st Infantry Brigade, (Training Support Bde), Division West, 1st Army, Ft. Lewis, WA. Capt. Mark D. Lehenbauer, 5th Special Forces Group (Airborne), Ft. Campbell, KY.
Capt. Eric A. Parthemore, Headquarters & Support Company, 864th Engineer Combat Battalion (Heavy) FOB Sharana, Afghanistan. Capt. Angela E. Reber, 201st Military Intelligence Battalion, 470th Military Intelligence Brigade, INSCOM, Baghdad, Iraq. Capt. Joshua A. Taylor, Bravo Troop, 1-73rd Cavalry Regiment (Airborne), 82nd Airborne Division, Ft. Bragg, NC. Capt. Daniel R. Young, Headquarters Company, Operations Group, Joint Multinational Readiness Center, Hohenfels, Germany. "It is an exceptional, diverse group of young Army officers," said retired Rear Adm. Larry Marsh, president and CEO of the Olmsted Foundation. "There are more Army selectees this year than ever before, and we are very pleased with the selection." Major David P. Elsen, Army Olmsted Scholar class of 2006, praised the program as an unbelievable experience. "I'm going to school full-time, learning another language in another culture, not only getting paid for it, but getting paid to travel on top of it! (My family and I) feel truly blessed, and our memories and experiences from our time in China will last for a lifetime," Elsen said. The U. S. Army Human Resources Command convenes an Olmsted Scholarship Selection Board annually to select finalists for submission to the Olmsted Scholarship Foundation Board of Directors. The board selects the scholarship recipients and announces their area of study in the spring. The tour of study is an accompanied tour. Officers interested in an Olmsted Scholarship for 2010 must apply to their career assignment officer at Human Resources Command not later than July 18. The next HRC board will convene on Sept. 10 and the Olmsted Foundation Board will make the final selection of scholars in March 2009. Specifics for applying for an Olmsted Scholarship can be found at https://www.hrc.army.mil/site/protect/Active/opfamacs/FELLOWS07.htm.